Like most NFL cheer teams, the Minnesota Vikings Cheerleaders are all required to be in school or fully employed in addition to their cheerleading commitments. 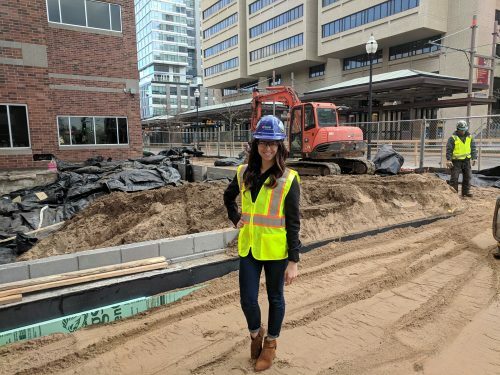 Rookie Vikings Cheerleader Dani holds a Bachelor of Science in Construction Management and uses the skills she has learned in school and on the field every day! Read on below to learn all about Dani. What turned you on to STEM and when? I remember having a fascination with architecture from a young age. I would ask my Dad questions about buildings that most kids would not even give thought to.I recall asking as an 8 year old, “what are those metal zigzags on the ceiling?” and he would explain to me that those were steel joists, and they bear on the masonry wall to hold the roof up and support interior walls. I became more and more eager to learn about the components of buildings and what makes them efficient for the purpose they serve. As I grew older I put my own sweat equity in as a construction laborer performing tasks including grading soils, framing and pouring concrete walls, demolishing structures, and finish work like drywall. I knew my career path had to be in the construction industry. Why did you try out to be a cheerleader? I believe that to be successful in life you must follow your passions. I tried out to be a Minnesota Vikings Cheerleader because my passion to perform, serve the community, and cheer for the Vikings could not be utilized the same anywhere else. Organizations that promote working hard and making the most of what has been given to you are hard to find, and MVC has been that and more! Please describe what you do in your science career on a daily. The best thing about my career as a Project Engineer is that every day is different. I get to see projects, like a hotel or 10-story tower, go from a sketch on a napkin to a physical building. Some really cool things I do in my day to day schedule include reviewing architecture plans for the mechanical systems of the building to make sure they operate efficiently, calculating the building structure to make sure it will stand, and estimating the total cost of buildings up to $100 million (That’s a LOT of money)! The overall goal of my work is to plan and construct buildings that are high quality and that people will value into the future. What does it mean for you to have a career in STEM? As one of the five percent of females with a career in the construction industry, I place huge value in what I do. To have a job in a male-dominated field can be difficult but I get the opportunity to prove myself to be smart, important, and an asset in my career every day. In the construction industry most projects have a set budget, and I use this as my opportunity to give clients the highest quality product by performing material reviews and value engineering when I can. It is very rewarding when an idea of mine is used because I get to physically see a result from it. By completing a construction project with values of quality and good work ethics at the front of my mind, I know that I am increasing the happiness of the people that get to occupy that building for a long time to come. How do the qualities that make you a great cheerleader benefit you in your STEM career? One would typically not think “cheerleader” and “project engineer” use the same qualities, but they do! The quality that I use most in both roles is being a good listener. The more time I spend listening to what other people value and appreciate, the more I am able to be a better communicator and provide quality results in my work. The other quality I see often in my career and also as a cheerleader is critical thinking. Decisions happen on the fly all the time, and being a confident decision maker is very important! There are stereotypes about cheerleaders in our society that make it seem unlikely that a cheerleader could be a construction manager. Obviously, these stereotypes are untrue, and you are a great example of that! How do you feel about breaking down negative stereotypes about cheerleaders?I know for a fact the stereotype of being a cheerleader exists only because people are uninformed about who we are as an organization. To be a Minnesota Vikings Cheerleader you must either be a full time student or work full time, so our team of 42 is a team of educated, smart, and bright women. I confuse a lot of people when they find out I work in construction and am also a cheerleader. Instead of explaining myself to them, I prove who I am though my actions. I can show a lot more about my determination and hard work ethic in my personality than trying to negotiate a good answer to why I am who I am. Best cheerleading experience? My best experience as a Vikings Cheerleader was the first home game where the national anthem was accompanied by a full field American Flag. As I stood facing the field eye level with the flag watching the red and white stripes wave, I got shivers and an overwhelming feeling of pride. In that moment I could not help but be so grateful for the opportunities I had been given in my life, and truly valued the mantra of living in the moment. Best career-related experience? My favorite experience is anytime I get to step onto the jobsite with my steel toed boots and purple Vikings hardhat complete with the Vikings horns, SKOL! What advice would you give your 12-year-old self? If I could give my younger self some advice I would tell her to be scared but do it anyway. You never know what can come from stepping outside of the limits you set for yourself! What’s one thing people might find especially surprising about you? I was once featured in a news segment for being a female on my high school trap shooting team.